Ronnie McFall. Pic by PressEye Ltd.
Portadown manager Ronnie McFall is hoping Saturday’s dramatic 3-2 victory can serve as inspiration for forward progress. The Ports managed to stop the rot of six successive defeats by battling back from a 2-0 deficit last weekend with 10 men. Now McFall feels the mental strength on show at Shamrock Park should breed confidence ahead of a visit tomorrow (Saturday) to Ballymena United. “People talk about fitness and everything but on Saturday we showed great mental strength and desire,” said McFall. 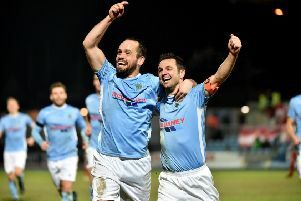 “The main focus now is on Ballymena and that Carrick performance should boost confidence. “I feel that even during the bad run of results we played reasonably well for periods but did not get the right breaks and conceded sloppy goals. “That left us with an uphill battle and it was the same on Saturday at 2-0, only we showed an abundance of desire in the second half. “We still felt in the match even at half-time and the next goal was crucial, then it became about pushing for an equaliser and winner. McFall maintains injury issues have been a key factor in the Ports’ struggle for consistency. “The situation at the minute means Garry Breen is suspended for Saturday plus I have Peter McMahon, Mark McAllister, Keith O’Hara, Jordan Lyttle, Jake Richardson and Christian Stewart all struggling,” he said. “Mark has a back problem, Jordan is scheduled for a cortisone injection and Jake also has knee trouble. “Keith has on-going back issues and Peter needs an MRI scan on his groin injury. “Pat McGibbon’s main objective since coming in as physio is to help us get players back from injury. “His experience during a good playing career can also help and it is great to have Pat back at the club. “No team can win all the time and it is about using the experiences of the difficult times to become stronger. Kick-off tomorrow (Saturday) will be 3 o’clock.